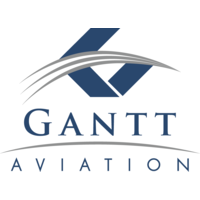 Aviation's most powerful operating cost application is here. 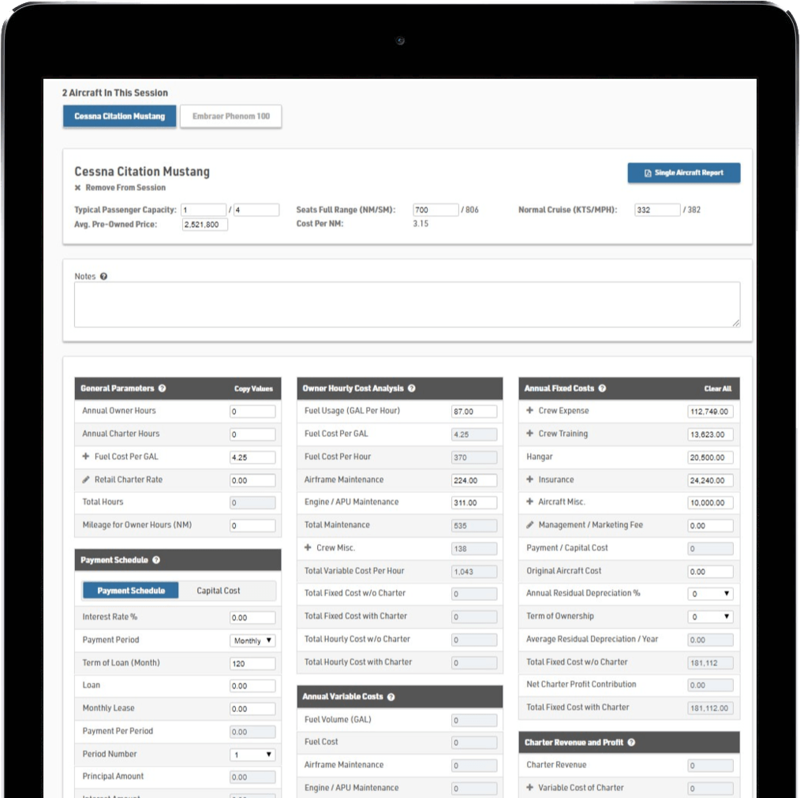 Aircraft Cost Calculator frees you from your desktop to offer a mobile solution you can access anywhere in the world. Designed for owners, operators, flight departments, financial institutions and charter operators. Aircraft Cost Calculator enables users to determine the true operating costs of the hundreds of aircraft and helicopters in our database. 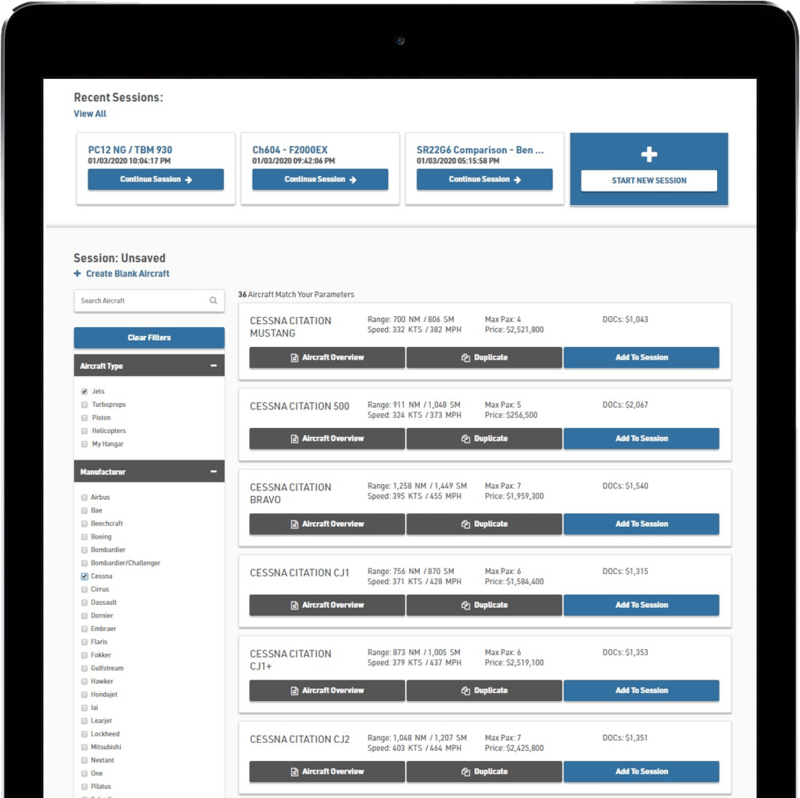 Pre-loaded data (fully editable by the user) based upon owners, operators, and fleet managers actual expenses accessible on any device. 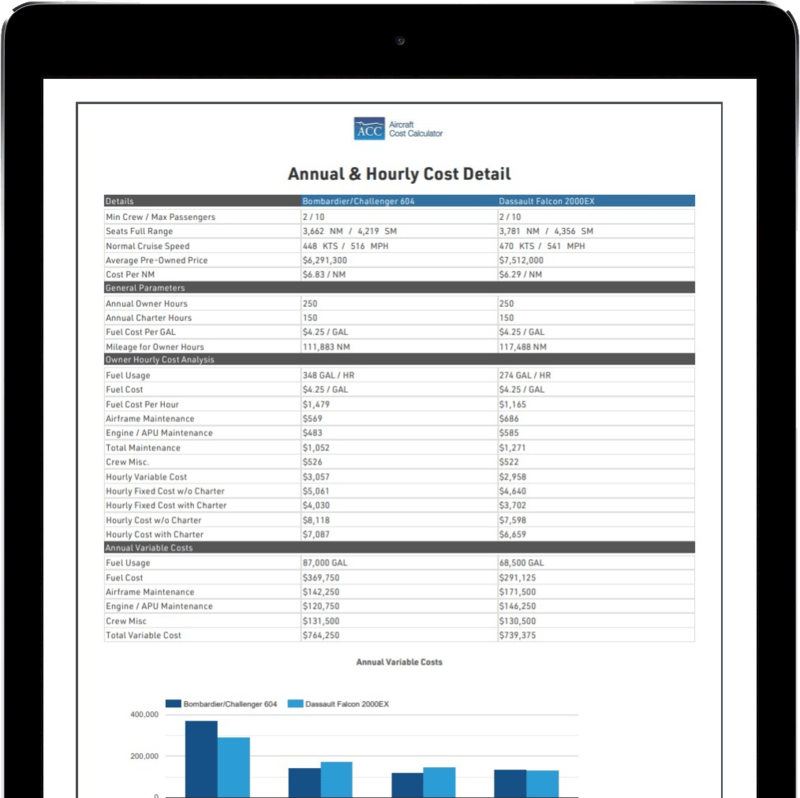 Aircraft Cost Calculator generates professional-looking reports custom-branded with your logo to share with clients and colleagues. You'll be able to produce the precise detailed reports you need in minutes, not hours, to make important, informed decisions about the true cost of aircraft operations. ACC is an intuitive global Web Application that easily allows users access to determine the actual costs of aviation - designed for private owners, commercial operators, fractional owners, flight departments, financial institutions and charter operators. Fully editable pre-loaded "real world" data for over 500+ aircraft - piston, turboprop, jet, & helicopter available in ONE application. Determine operating costs based on your actual utilization levels, inclusive of charter revenue contribution. Understand how financing, capital cost considerations, residual values, and lease payments affect your operating costs. Piston only, Helicopter only, Turboprop & Jet subscription options available. 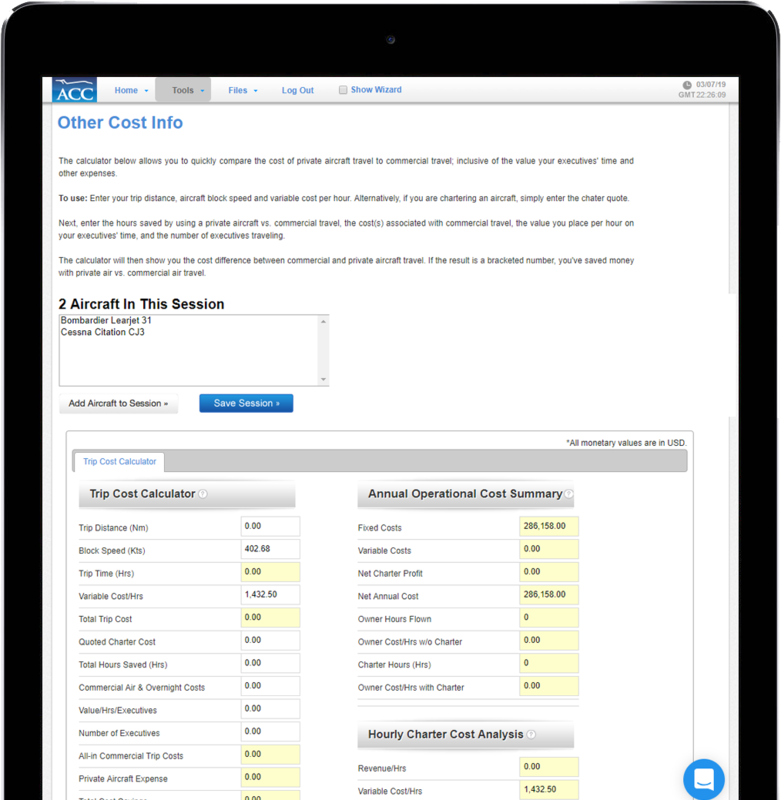 ACC can quickly and efficiently generate in-depth reports for high-level presentations - clear,concise, and graphical presentations. Create custom reports with your company's branding. Compare unlimited number of aircraft side-by-side. See the range of aircraft overlaid on map of the world - specific to your location. Select from 9 different reports that ACC generates in seconds. Depreciation schedules fully editable by the user. "Trip Cost Calculator" which can clearly show the cost savings associated with business aviation versus commercial travel - including the Time Value of Executives. Specification sheets for all of the machines in our database, including the latest pre-owned pricing. Currency Conversion & Imperial to Metric Units at the click of a button. ACC's interface is incredibly simple to use and navigate. Save and view all of your sessions. View subscription plan and history. Upload your company logo and contact information. Live Chat for any questions you may need answered. "It's with my pleasure to refer Jack Prewitt to your service, which we have found to be accurate, straightforward and of real benefit to our clients. Don’t hesitate to use my name or to have any interested broker call me. It is a very good product." - Stephen Ramsden, President - Corporate Aviation Holdings Corp.
"Chris was kind enough to run a sample report comparing two aircraft over a specific mission, and the results were +/-3 % of what I came up with on my own. Difference is, using ACC it literally took 10 minutes versus what would take me an hour + to do by hand." "ACC was key in my initial work to build my business model and validation process. Without your data, I don't think I ever would have been able to convince myself and those supporting me to do this."